After I posted my find of all the wine that had been misplaced, I also found a few bottles of beverages that were not wine, and we have been known to enjoy a glass of other drinks from time to time. So I shall wander a short way from wine for the moment. The first two bottles that I found were happy finds. I kept thinking that I had another bottle of Booker’s True Barrel Bourbon, but I could not locate it, now I have. 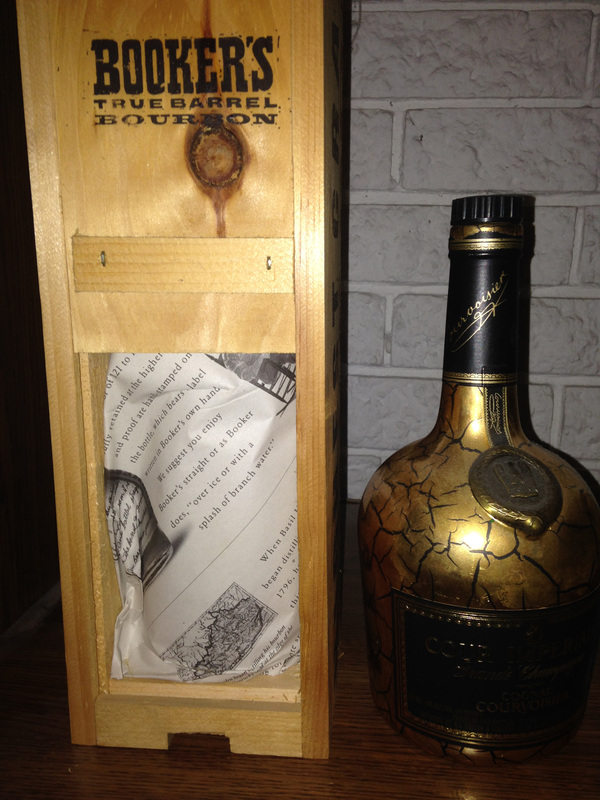 The bottle was still in the original paper wrapper safely secured in the wooden box that it is purchased in. Every now I then I just enjoy a glass of sippin’ Bourbon neat in a Brandy snifter, just perfect after a dinner with friends. Another bottle that I found, can be linked to wine, as it is a distilled wine, actually this beverage is twice distilled. Distilled wines are called Brandy, and as the old saying goes all Cognacs are Brandy, but not all Brandy is Cognac. I found a bottle of Cour Imperial Grand Champagne by Courvoisier, with the emblem of Napoleon. Grand Champagne does not refer to the sparkling wine, but it refers to the two most famous Crus of Cognac; Grande Champagne and Petite Champagne. The curious thing is that Grande Champagne in area is actually less than half the size of Petite Champagne, but very important to be noted on the label. In the old days the varietals planted were Ugni Blanc, blended with Colombard and Folle Blanche, but now it is basically Ugni Blanc. The original wine made I have heard many times, is that it is nothing to write home about, but when it is distilled, and especially after the second distilling it becomes a wondrous beverage; of course it may take twenty to thirty years of aging on the premises to evolve which adds to the cost of the Cognac. Of the other two bottles that I found one made my Bride very happy and the other was a bottle that I was not familiar with, and I believe it was bequeathed to us, since we tend to have the most parties with the family. One of the bottles was Seagram’s 83 Canadian Whisky which is no longer produced, by the third corporation to have the Seagram’s label. This was made when Seagram’s was still being made in Ontario, and now it is made in Quebec, and I am a fan of Seagram’s V.O. Canadian Whisky. It is a rye whisky, which most of the Canadian whisky brands are known for, in fact, here in the Detroit area, it was not uncommon to hear a patron at his local watering hole to request a “Rye” meaning a Canadian Whisky at the expense of the American Whiskey. The excise tax banderole is still unbroken and it carries the date of 1982, so it should still be totally drinkable and I am curious to try it. The bottle that made my Bride happy was originally created by James Pimm in the 1840’s, and I find it amusing that while she is not a Gin drinker per se, she so enjoys Pimm’s No. 1, which is a gin made with herbal botanicals, caramelized orange and some other delicate spices. Pimm’s No. 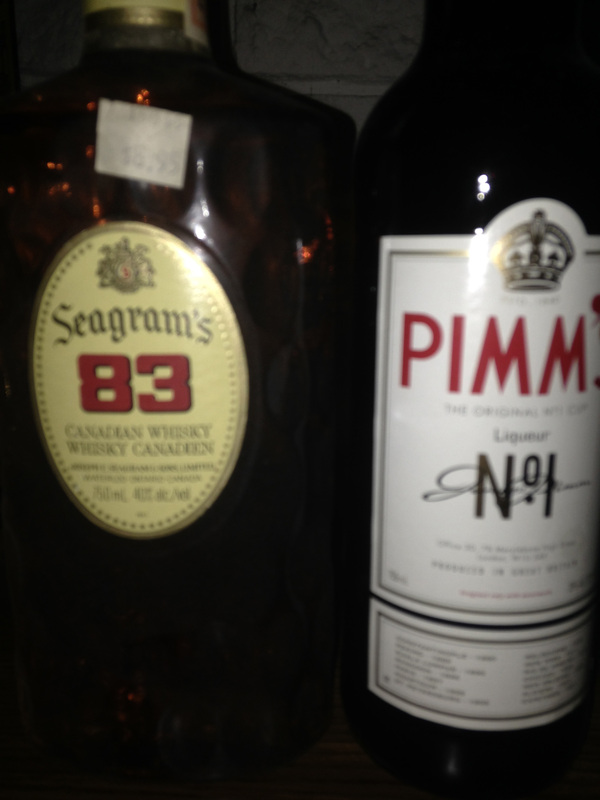 1 is fabled, but the company has actually created several other Pimm’s up to No. 6, I believe, though she has always requested a glass of the original Pimm’s Cup on our travels. This is just a good lesson for me, to maintain a stricter watch on my inventory. This entry was posted in Wine and tagged Brandy, Cognac, Colombard, Cour Imperial, Courvoisier, Folle Blanche, France, Grand Champagne, Ugni Blanc. Bookmark the permalink.